At Midwest Precision Manufacturing, customers in the plastic injection mold industry rely on our deep hole drilling capabilities for their precision drilling needs. The parts shown here are blocks used in the plastic injection molding process. 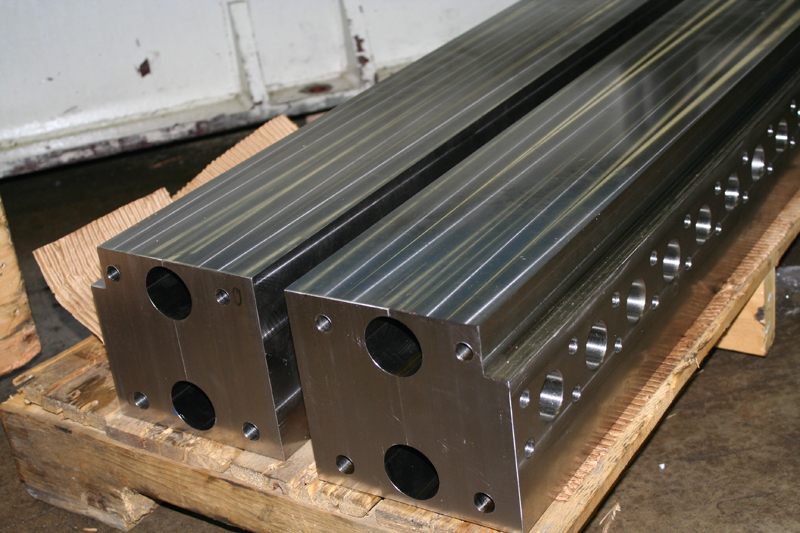 The blocks are machined from 316 stainless steel and have an overall length of 36", a width of 18", and a height of 20". Two 2.5" diameter holes were drilled through the length of the block, to tolerances of ±0.001" and a 32 Ra surface finish. The four holes in the corner of the blocks measure 0.375" in diameter and were drilled to tolerances of ±0.005". Both gun drilling and deep hole boring processes were used to create all of the holes needed for this project. We have the ability to drill offset holes as well as a number of other challenging geometries, while meeting all customers' precision requirements. A total of 5 blocks were drilled for this project, and the order was completed in one week. For additional details about the precision deep hole drilling project, see the table below, or contact us directly. 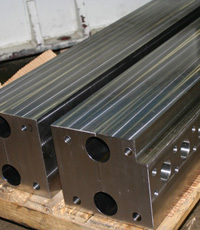 (4) Ø 0.375" Holes Through ± 0.005"